With everyone from Facebook’s Mark Zuckerberg to analysts at Goldman Sachs boldly claiming VR as the next computing platform, we believe it is critical strategic decision makers — product managers, marketers, and investors alike — better understand the industry’s potential early adopters and what they really want from our industry. Understanding the specifications and various use cases for an emerging technology is important for consumers. Awareness at both the brand and category level is a unique necessity for the virtual reality industry. That is why we asked consumers whether they were aware of recent technological developments in VR. These developments ranged from product releases, rumored features for currently unreleased devices, or even academic advancements. Surprisingly, only 8% of the UK sample claimed enough confidence to say they knew a lot about VR. 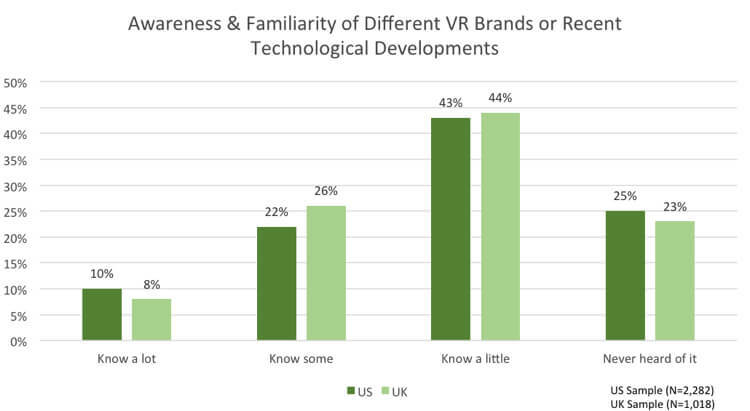 Out of the entire sample, 23% had never heard of virtual reality in the UK. 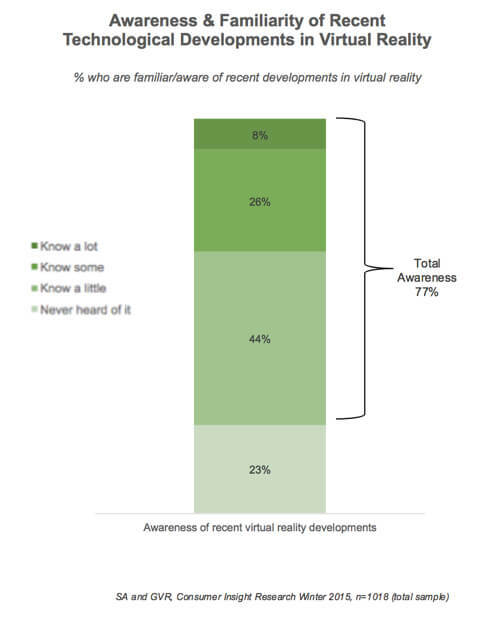 In the US, that number was 25% (and only 10% claimed to know a lot about VR). 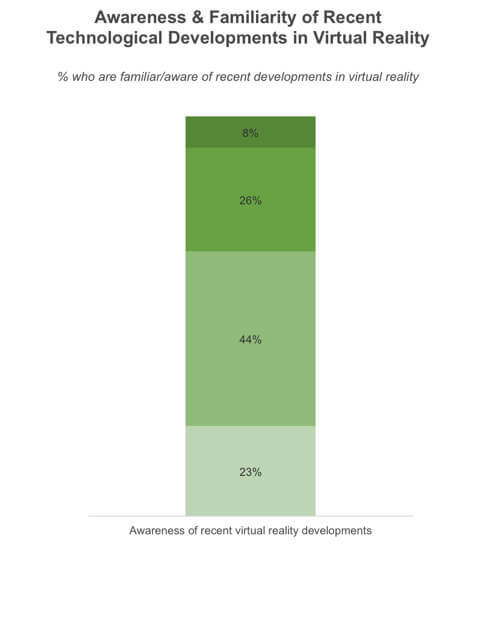 In the US and UK, those who polled higher in awareness for VR included gamers and those looking to purchase a VR device. These numbers pose a significant hurdle for brands trying to establish presence in this young market. The advancements in both technology and product availability are important for business-to-consumer relations. Awareness in this field could be directly linked to how young the commercial VR industry is or a gap in the marketing of various hardware and software. Considering the enthusiasm for VR, one might be tempted to ignore many of the concerns. However, in both the US and UK samples, with over 3,400 respondents around the globe, similar concerns and fears keep popping up. Specifically, within the UK, 73% of the parents who specified a concern cited adverse health effects for their children using virtual reality. Greenlight VR expects headset cost and lack of content to be choke points for the consumer adoption of virtual reality near term, but VR’s greatest obstacle for 2016 may be consumer awareness. Awareness is most important at the brand level, but with new consumer technologies like virtual reality, it is also an important metric as overall category awareness will impact the success of the individual brands. Therefore, it would be wise for the companies in the industry to increase marketing activities. The future of VR will be dependent on more than just word of mouth by early adopters. It will require new consumers to actually experience for themselves what it’s like to venture into a virtual world.